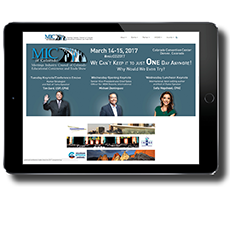 Denver, CO – The Meetings Industry Council (MIC) of Colorado hosted a record attendance of 1200 attendees at the 17th Annual MIC Conference & Trade Show on March 14 and 15, 2017. Feedback from those that attended the two-day conference at the Colorado Convention Center declared it a resounded success. The conference included a risk management panel made of industry leaders who directed meeting planners on how to assess security risks in our everchanging meeting and convention industry. 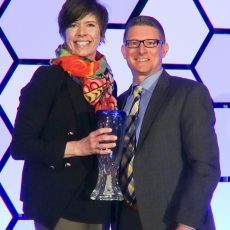 There were fifteen educational breakouts during the conference along with an opening and closing tradeshow reception which allowed attendees from all facets of the hospitality industry to connect. Tim Gard, CSP, CPAE Hall of Fame Speaker, opened the conference presenting three fast and easy ways to connect with customers using the #funwithtim formula for success. The Keynote focused on why employees should perform at least one Simple Act of Kindness (SAK) for every customer. Wednesday morning State of the Industry Keynote Michael Dominguez, Chief Sales Officer for MGM Resorts, informed attendees on why 2017 is going to be a year of major disruption, major change and major instability and what that will mean to the hospitality industry and travel in general. International, best-selling author and Hall of Fame Keynote Sally Hogshead, CPAE, coached lunch guests on how to fascinate their clients and co-workers in 9 seconds using your unique personality advantages. MIC welcomed Governor John Hickenlooper as a guest lunch speaker for the second year as he shared his thoughts on how the hospitality industry affects Colorado and its evolving economy. The Governor, along with MIC 2017 Chair Sidney Stoper, presented Steve Kinsley, President of Kinsley with the 2016 MIC Leadership Award honor. 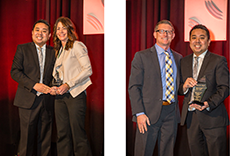 MIC 2017 Co-Chair Awards, presented by Chair Sidney Stoper, J&S Audio Visual Account Executive, went to Jenn Kimbel, CMP, Events Manager XP and Engagement with Sage, and Lora Knowlton, Owner Current Events LLC, who was unable to attend. 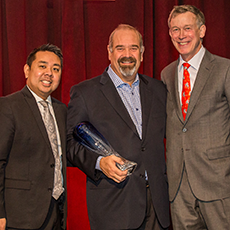 MIC 2017 Chair Elect, Dean Savoca, Performance Consultant, Trainer, Executive Coach and Keynote Speaker, presented Sidney Stoper for his dedication and service as the 2017 Meetings Industry Council Chair. The MIC of Colorado is a coalition of 13 professional organizations related to the meetings and events industry. The Council’s purpose is to enhance collaboration among participating organizations through networking and education, while being the main source for industry knowledge and consultation as well as foster the continued growth of the meetings and event industry in Colorado. The 18th Annual MIC Conference will be held on March 13 and 14, 2018 at the Colorado Convention Center.